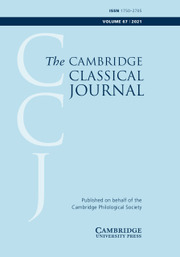 The Cambridge Classical Journal publishes high-quality scholarly articles in all areas of Greek and Roman studies: literature, philology, philosophy, history, art & archaeology, reception, history of scholarship. CCJ has a publication history dating back to 1882 and is well known for some classic pieces which have changed the direction of the field. It is the journal of the Cambridge Philological Society but invites submissions from all scholars. Did Greek dramatists write stage instructions?